Here’s my story about how I selected my CTEL study guides. I detail the specific CTEL study methods I used in my prep book that raised my score to passing-level. The first time I took the California Teacher of English Learners (CTEL), I failed 2 parts. Me. A veteran California credentialed teacher of almost 10 years. I needed my CLAD credential to ensure I have a teaching job next year! What happened? The CTEL practice tests were just a waste of time. My CTEL book didn’t cover the same information I confronted on my testing day. 1. I freaked out about the CTEL. If I didn’t pass I might not have a job. 2. I knew how to teach but never used the terminology. Who talks about theory to students? 3. My teaching strategies worked in class, but I didn’t remember the strategies by name. 4. It’s been a long time since I wrote an essay answer. My essays did NOT help my score! 5. To save money, I bought a cheap CTEL study guide to help, but it was outdated, incomplete, and had so many errors that I wasted my time and money. Now I know better; and—now—so should you! Whether you have taught in another state or hope to get into your own classroom for the first time, the CTEL lies ahead. …Know What You’re In For! I’m not the only one caught off guard by the depth of California Teacher of English Learners questions and the terms found on the exam. When was the last time you took a course in language acquisition? Do YOU remember the theories and terms? Is your list of acronyms current? SEI? DLE? SDAIE? ELA? How well do you recall the state and federal laws that may impact EL students? Do you know current research-based theories and models for language acquisition? If you are fresh out of college and ace tests, you may be fine taking the CTEL tomorrow without studying. But my test experience showed me that I needed more help to review. Do you? A 19-page CTEL study guide overview (YES! 19 pages) of all you need to know can be found at the official website: http://www.ctcexams.nesinc.com/content/docs/CX_SGsection2.pdf. It’s a good idea to skim through this CTEL exam study guide outline for ONE REASON. The site explains the test and scoring in section 1 of the PDF listed above. Their first tip to pass the CTEL? As teachers, we give study guides to students to help understand their material. We have been given review guides by our teachers to help us focus on important information. Guess what? Good study guides still work! Good CTEL study guides provide questions that ask you to recall information. Research shows that if you use a CTEL books as intended, you’ll quickly find out which information you don’t know. Then, you can narrow your CTEL study time to focus on that information. If you look at reviews of CTEL test study guides, you will find that many test-takers credit their success—or failure—to the use of a prep book. The following CTEL exam cheat-sheets provide step-by-step tips that help you pass the California Teacher of English Learners quicker and in less time. We all may be brilliant teachers in the classroom, but unless you are a brilliant test-taker, you are going to need to purchase preparation materials that can help you pass all three parts of the CTEL. 1. Look for a CTEL study guide that is thorough, even if it is boring! Your #1 goal is to pass the test! It matches the 19-page CTEL PDF document in its terms and explanations. 2. Find a CTEL guide that is organized like the test and is easy to use. It should have three parts, one for each of the subtests. Check carefully the Assessment and Instruction section so it reflects current theories and strategies for teaching. A Table of Contents and/or Index lets you find information fast. 3. Check out the constructed response section (there better be one!) in the book for tips on the essay portion. Is there at least one example of a strong essay? Is there an explanation of WHY the essay is strong? 4. Find a CTEL study guide that allows you to practice taking the test! Is there at least one CTEL practice test for each of the three sections of this exam? Are there easy to understand explanations of correct AND incorrect answers? Are there constructed response/essay practice questions for each section? **Remember that many test-takers found this to be most helpful when studying! 5. Be picky about typographical or grammatical errors! A typo may be a simple mistake or indicate a poor CTEL study guide that won’t help you pass! 1. DON’T: Buy CTEL study materials without looking at reviews on Amazon.com or Barnes and Noble! Save time and money: My old book had poor reviews, but I never read them. Save yourself from “freaking out” when you find typos or wrong answers! 2. DON’T: Be “tricked” into purchasing an outdated CTEL study guide. The acronyms change; the theories change; the strategies change; and the test changes. 3. DON’T: Think that all study guides for the CTEL were written by people who know this assessment. Just because the it’s published by a big-name company doesn’t mean it’s a good CTEL guide! 4. DON’T: Expect that it’s going to be a fun read. It may be dull, but it’s not meant to be a thriller! There’ll always be people who “cram” for the exam. It may work for some, but it didn’t work for me. Many of my colleagues warn that it takes motivation and persistence to study for the CTEL and achieve a passing score. You must put some time in! 1. 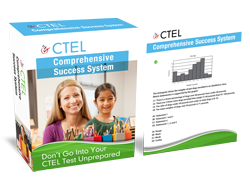 Many test-takers say that 4-6 weeks is a good time to begin using a CTEL prep guide. 2. Plan to use your CTEL study guide every day for a set amount of time. 3. Studying 20, 40 or 60 minutes at a time is better than a six-hour cram session. 4. Read through explanations of the answers; many test-takers say this is key to passing! 5. Practice active reading: find a good study space, have a purpose for reading, and use a highlighter as you read. You can take all three at the same time. It’s cheaper, but be prepared to spend 6 hours that day! What’s Your Final Action Step? There are over 1 million students in California who need teachers to help them with the English language. They need you. Don’t let the CTEL test stand in your way. Get the best CTEL study guide. Use it well. Pass the test. Go to: Do You Have These Symptoms Of CTEL Test Anxiety? It actually covers the real CTEL! FREE CTEL practice questions (just like the exam). By CLAD/BCLAD credentialed teachers who passed. Get FREE CTEL Study Guide Now!